If you believe the author, the president of the United States is one of the two monarchs remaining in the world; the other is the pope. The presidency differs from the papacy in that its operation is becoming increasingly medieval. The president no longer administers a government, but is surrounded by an immense crowd of courtiers, whose interest is not so much government but the president's repute. Alexis de Tocqueville came to the United States in 1831 to study the penal system. He duly produced a report on that subject, but the chief fruit of that trip was Democracy in America, a book which sought to answer the question, “Is democracy compatible with liberty?” Somewhat surprisingly for his French readership, the answer was “yes,” at least in the American context. However, the book's qualifications and dark intimations, partly about democracy and partly about America, have kept commentators parsing the text ever since. 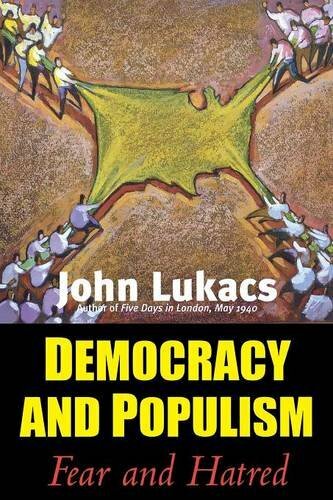 In Democracy and Populism, John Lukacs continues the tradition, with the emphasis on the dark intimations. The book is really a set of meditations on how terms like “conservative,” “liberal,” “national,” and “popular” have changed meaning over the past 200 years: at times, the book is an exercise in lexicography. However, there is a thesis, which is that liberal democracy in America is finally giving way to nationalist populism, a century and a half after the rise of populist nationalism began in parts of Europe. Lukacs is disenthused with President George W. Bush and such of his works as Lukacs can bring himself to mention, but he does not blame any individual or party. Rather, the devolution of democracy is a feature of the end of the modern age. The terms Right and Left still have meaning, but we are cautioned to keep in mind that their content and their trajectories change over time. When Tocqueville was alive, there still were people who were of the traditional Right. They opposed electoral democracy and proposed to defend historical forms of society based on status. The Left they opposed was united chiefly by its belief in progress. It included Liberals, who were interested in extending personal freedoms to an ever-widening fraction of the population. It also the proponents of popular sovereignty, who were keen on advancing the economic and cultural integration of the new nation state. The Liberals and the Populists ran in tandem for many years. In the second half of the 19th century, they tended to sort themselves out into Socialists and Nationalists respectively, with the Classical Liberals gradually becoming irrelevant as their institutional reforms succeeded. During the 20th century, the Nationalists defeated the Socialists by absorbing their programs: Hitler was as much a child of the French Revolution as Stalin was. In the early democratic period, it was the aggressive Left that hated and the Right that feared. After about 1870, the situation reversed, at least in Europe. Populist nationalism did many good things, but there was always an element in it of hatred: hatred for foreign things, certainly, but also hatred for those members of the national community who were insufficiently national. Patriotism and nationalism always overlap, but patriots had always been more concerned with concrete things they like about their country, and far less with abstractions that distinguished it from other countries. The Left, in contrast, and especially the Left in power, was driven in part by its dread of reactionaries, but chiefly by its terrified sense that it was not really well liked by the populace it claimed to represent. In Lukacs' telling, their fear was well justified. He also allows that fear is the beginning of wisdom. By “the modern era,” Lukacs means for the most part “the European Age,” from about 1500 to 2000. Particularly interesting, though, are his references to the “modernity within modernity,” the self-conscious “modernism” that began after the First World War and enjoyed what Lukacs holds to be a vulgar revival in the 1960s. He points out that the pre-modernist works of James Joyce, such as Portrait of the Artist as a Young Man, have aged pretty well, while Ulysses has become a period piece. More generally, he says that the modernist era was the last time when artists could claim, in Ezra Pound's phrase, to be the “antennae of society.” By the end of the century, art had become too sodden by commerce to cast shadows of things to come. In this book, Lukacs continues his polemic against progress, or against what he calls “the myth of progress.” Both Communism and anti-Communism were informed by the premise that history was progressive. I find this particularly notable, since certainly there were anticommunists who believed their cause gained an added measure of nobility from the very fact that history had doomed it to ultimate failure. On the other hand, and this interests Lukacs more, anticommunism became not just a feature, but the key component of the new “Conservatism” in America in the last half of the 20th century. This Conservatism was in fact remarkably “Leftist” in the sense that Tocqville would have understood. Whatever its other concerns, it had no interest in conserving things, natural or human. One notes how many horrible things over the past two centuries have turned out to be less formidable than was supposed at first. In the midst of a rather damning critique of Hannah Arendt's The Origins of Totalitarianism, for instance, Lukacs observes that her prediction that totalitarian states would become more extreme with the passage of time was disconfirmed within five years of the publication of the book, when the Khrushchev Thaw began in the Soviet Union. He proposes counterfactuals that suggest ours is far from the worst of all possible worlds. Suppose that revolutions of Lenin and Kerensky had not occurred, and the Czarist Autocracy had been one of the victors at Versailles. Yalta in 1918 might have been substantially worse than Yalta in 1943, if for no other reason than that the division of Europe might then have been sustainable. Also, Tocqueville was correct when he astonished his contemporaries by predicting that major political revolutions would become less common in advanced countries. This is because, in a condition of popular sovereignty, there is nowhere to stand against popular sentiment, whose very ubiquity tends to slow the development of ideas. The near disappearance of persons of genuinely independent mind is one of the key features of our present situation, which Lukacs does not consider altogether happy or promising. This brings us to the most recent stage in the devolution of democracy, the one that troubles Lukacs the most. It was bad enough that the conflicts over policy that characterized the 19th century became, by the middle of the 20th century, a politics of popularity. That, at least, had historical precedent. The more disturbing transition was the change from the search for popularity to the generation of celebrity. On a practical level, celebrity has even less connection with a candidate's abilities and intentions than does his popularity. However, Lukacs finds something genuinely uncanny about the phenomenon of celebrity. To him, it smacks of the glamour of Antichrist, an association he says may not, in the long run, turn out to be altogether metaphorical. As we have noted, Democracy and Populism does not present a connected argument, but a series of meditations on the mutability of the meaning of political language. So, strictly speaking, there is nothing to refute. Still, one cannot help but notice that, in many respects, Lukacs has simply not been paying attention. His assertion that the Bush Administration decided on war in Iraq “for the main purpose of being popular” is nonsense on stilts. The war was the implementation of the recommendations of a school of policy that goes back to his father's administration. The current president's predecessor tried to implement this course, but could not do so because he could not generate the domestic support. The policy may be right or wrong, but the choice to implement it, far from pandering to public opinion, was the sort of thing one might have expected from a Viennese Habsburg before 1848, in an age when it was still possible to conduct high policy without regard to what the public thought. That would, actually, be more consistent with Lukacs' thesis that premodern conditions will return as the modern age ends. The author goes on at length about the overwhelming influence of the media and its ability to stifle dissent before it even begins, so much so that the regime can ignore the small independent press. Is it really possible that he does not know that the major news media and the entertainment industry promote a politics quite inconsistent with the views of the Republican Party? About the blogosphere I will not speak: the term “Internet” does not even occur in the Index. Similarly, the author takes many pages to bemoan the rise in criminality as a mark of the decline of the state. And that was true, through the 1970s and 1980s. The situation turned around in the 1990s, at least in most of the United States. The civil peace may not hold, of course, but the notion that lawlessness is an irreversible trend has been as decisively refuted as the unstoppable march of totalitarianism. Regarding the future, the author asserts at one point: “A new barbarian feudalism is bound to come in the future: but not yet.” If you wait long enough, I suppose anything will happen, including barbarian feudalism, but there is nothing in the current state of the West, or even of the world as a whole, to suggest that Mad Max will appear on the horizon anytime soon: quite the opposite. The trend toward the integration of the human race, which goes under names like “globalization” and “Americanization,” is quite real, and in that sense progress is real, too, even if you don't like where it is going. Lukacs aspires to speak for the universal perspective of the Catholic Church, and even of the Habsburg tradition. Surely such a perspective should see the potential for more in the world of the early 21st century than for mere chaos. A very pure version of the Red vs. Blue electoral map. The George W. Bush versus John Kerry election in 2004, as described by John here, is a very interesting foretaste of things to come. Bush is described, accurately in my opinion, as a cheerleader for the war in Iraq launched in 2003, while Kerry was interested in the details but less obviously committed to do whatever it was that needed doing. In retrospect, our subsequent Presidents fit that mold as well; President Obama's Hope and Change, and President Trump's Make America Great Again! themes are both more about allowing people to project their hopes and desires onto a charismatic figure, than a detailed policy brief. President Obama didn't manage to live up to everyone's expectations, but he remained popular nevertheless. We might expect that Trump's campaign promises will follow a similar path, and perhaps his approval rating as well. Last night, John Kerry and George Bush were trying to do different things. Kerry was trying to start an argument about factual and policy questions related to Iraq. Bush was questioning Kerry's consistency. The theme of Bush's remarks was that nothing is so important in winning a war as the obvious determination of the leadership to win it. He repeated the point so often that he sometimes sounded monomaniacal. Kerry did very well, but he signally failed to sound as determined to win the Iraq War as Bush did. The failure is lethal, I think. Kerry did not dispute that the war should be won; he was less clear about why or how. A tie is not enough when you are 10 points behind. Prior to the debate, viewers chose Bush over Kerry in handling the Iraq war by 54% to 40%. After the debate, the comparable figures were essentially unchanged, 54% to 43%. As I have noted before, Kerry's tepid pro-war stance actually discourages a large part of his base. Provided the incumbent seems acceptably competent, it also does nothing to attract people who think that war and security are the most important issues. I predict that Bush will ace the domestic policy debates, much though I disagree with most of his program. There are no global solutions to the questions involved, and Bush is actually pretty good at MBA stuff. If you could have really small elephants as pets, I would totally have one. The first indication came on September 20. Cardinal Camillo Ruini [president of the Italian bishops' conference] spoke to the permanent council of the Italian bishops' conference, and repeated the duty of the Christian West to "oppose organized terror with the greatest energy and determination, without giving the slightest impression of considering their blackmail and their impositions," and at the same time, to transform into "our principal allies" the elements of the Muslim world that desire liberty and democracy. The child has been born. It may be illegitimate, but it's here, and it must be reared and educated. Such assistance would be consistent with either Bush or Kerry's plans for Iraq. The Kerry people might find it embarrassing if it were offered without his intervention. In France, [for instance,] the determination to spend is similar, but the tactics being used would be quite familiar in many a state capital. The government owns the major electric and gas utilities, which face huge pension bills. You might think that would harm the budget, but France has a better idea. The two utilities will transfer part of their pension obligations to the government, thus making them more attractive to investors. They will pay the government at least 7 billion euros to take on the obligations - and that money will count as revenue for measuring the budget deficit. It is a neat trick to balance a national budget by taking on additional obligations. This is almost as much fun to think about as the tiny elephants. An important difference (between America and Europe, not the elephants) is that the balanced-budget requirements are self-imposed by the states. As far as the federal system goes, states can issue all the debt they like, on or off-budget. States without these caps have defaulted in the past, to the surprised consternation of their foreign creditors. The euro restrictions, in contrast, are imposed from the outside. Once again, we see that the European Union is becoming a system of post-democratic tyranny, mitigated by unenforceability. As I've said before, John wasn't a fan of Ronald Reagan, but John did think Reagan had some success as a chief executive. In fact, John saw him as embodying a bit of the archetype of the king [or the Emperor], the still center around which the world turns,. This is a bit odd for a late-twentieth century American president, because what we usually call the Imperial Presidency is a whirlwind of energy and rapid-fire decision-making, immortalized in Teddy Roosevelt. Standing there for a moment filled with dread Frodo became aware that a light was shining; he saw it glowing on Sam's face beside him. Turning towards it, he saw, beyond an arch of boughs, the road to Osgiliath running almost as straight as a stretched ribbon down, down into the West. There, far away, beyond sad Gondor now overwhelmed in shade, the Sun was sinking, finding at last the hem of the great slow-rolling pall of cloud, and falling in an ominous fire towards the yet unsullied Sea. The brief glow fell upon a huge sitting figure, still and solemn as the great stone kings of Argonath. The years had gnawed it, and violent hands had maimed it. Its head was gone, and in its place was set in mockery a round rough-hewn stone, rudely painted by savage hands in the likeness of a grinning face with one large red eye in the midst of its forehead. Upon its knees and mighty chair, and all about the pedestal, were idle scrawls mixed with the foul symbols that the maggot-folk of Mordor used. The eyes were hollow and the carven beard was broken, but about the high stern forehead there was a coronal of silver and gold. A trailing plant with flowers like small white stars had bound itself across the brows as if in reverence for the fallen king, and in the crevices of his stony hair yellow stonecrop gleamed. 'They cannot conquer forever!' said Frodo. And then suddenly the brief glimpse was gone. The Sun dipped and vanished, and as if at the shuttering of a lamp, black night fell. John mentions David Warren in passing in this blog entry. Warren wrote a column for the Ottowa Citizen until 2012, mostly about the war on terror, but sometimes about his travels around the world, or Catholicism, or whatever struck his fancy. I was a regular reader for years, and then I just dropped off after a while. Like John J. Reilly, Warren was a defender of the Iraq War in the early 2000s, but when I have dipped into his new website on occasion, I get the impression that he is penitent for this, and for anything else he might have done. Back in the days of the Soviet Union, Radio Moscow loved to air commemorative stories. They were essentially documentaries that consisted half of commentary and half of historical revisionism. For whatever reason, National Public Radio in the US has the same predilections. It would be unfair to say that they were delighted with the death of Ronald Reagan last Saturday, but they did rise to the event with singular enthusiasm. They actually cancelled regular programming for a while, so they could offer "continuous coverage." How do you offer continuous coverage of a wake? Hourly bulletins to say the deceased is still dead? For myself, I cannot say that I was ever a great fan of Ronald Reagan. I actually voted for Jimmy Carter in 1980. I did vote for Reagan in 1984, however; there's no point in arguing with success. Much nonsense has been written about Reagan's alleged divorce from the ordinary operations of government. In fact, he was an effective manager of a familiar type. Still, his chief abilities as a leader where charismatic, mimetic, symbolic. The traditional king, it has been said, is not an executive, but he "subdues opposition through the rumor of his imperturbability." There's the Reagan presidency for you. The extraordinary thing about the West that was exposed, in the lightning of 9/11/01, is that it is one country, in an advanced state of decadence, turned against itself. And for one of the parties to this spiritual and intellectual civil war (not a battle of ideas, but a battle of "ideas against anti-ideas"), it is more important to defeat their internal enemy than to confront any threat from abroad. The loyalties are no longer to nations. Instead, an Italian who votes for Berlusconi has more in common with an American who votes for Bush, than either of them has with his own countrymen who vote the other way. The idea that the Left is becoming transnational is now commonplace; Michael Moore wins awards in France for propaganda films that are praised from Berlin to Berkeley. However, as I have been arguing for a few years, there has been a corresponding internationalization elsewhere on the political spectrum. This sentiment, nowhere a movement, reconceives patriotism as an aspect of a broader sense of Western identity. The speech that Aragorn gives to the Host of the West in The Return of the King film might stand as an expression of it for the time being, until life starts to imitate art. Barnett says we need two kinds of military forces. One he calls "leviathan"...a relatively small body of fierce warriors, heavily weighted to special-forces teams -- the kind of forces that achieved such speedy victories in Afghanistan and Iraq...But we need very much larger forces, set apart from the warriors, of what Barnett calls system administrators or sys admins. "The sys admin force will be civil affairs-oriented and network-centric," Barnett writes, "an always-on, always-nearby, always-approachable resource for allies and friends in need." They will be doing most of the things our military forces have been doing or have been trying to do in Iraq since May 1, 2003. This is precisely what the Pentagon does not want to do. The Clinton Administration, through timidity, let the Pentagon get away with preparing to fight a high-tech version of World War II. The Bush Administration, in its first few months, let the Pentagon carry on the same way, but not through timidity: they had a theory about it. June 3 BUKAVU, Congo -- Renegade commanders captured this strategic Congolese town Wednesday, setting off a crisis that threatened the fragile transitional government and a peace process that ended five years of war....U.N. Secretary-General Kofi Annan condemned the capture of the eastern Congo city and called on the region's warring parties to abide by an earlier cease-fire. The United Nations defended its troops' inaction against the factions that took Bukavu, saying the mandate of its 10,800-strong Congo force did not extend to battles... Hundreds of people rioted outside U.N. headquarters in Kinshasa and in the main northeast city of Kisangani, blaming U.N. forces for failing to stop Bukavu's fall. The crowds in Kinshasa threw stones at U.N. headquarters and set vehicles afire, while protesters in Kisangani burned U.N. vehicles and a U.N. office. Yes, you read that right: the mandate of the UN's army (an overwhelming force in that context) dids not extend to battles. International forces of neutrals and NGOs really should be keeping the peace in places like the Balkans and the Congo. However, it is becoming clear that some constitutional feature of the UN prevents it from doing this effectively. Russian-American relations went from frosty to arctic after the first meeting between President McCain and President Vladimir Putin, when McCain made his notorious “evil ice dwarf” comment to reporters on the flight home. I'm not sure whether it would have been better or worse to have such a bellicose man as president during Putin's reign, but it wouldn't have been dull. We may yet see the spectacle of a Presidential election destroying one or both of the current American parties. Unfortunately, personal politics will not turn out well for anyone, but it seems to be an inevitable historical development. The Administration was not so lucky with an immigration measure that, in effect, granted provisional legal status to everyone in the United States, and this without first ensuring that the federal government had physical control of the borders. The immigration enforcement agencies had to stand down at the borders (including airports) and internally; the chance of apprehending someone whom it might have been proper to detain under the new rules was too small to justify the expense of acting. The immigration bureaucracy was deluged with millions of applications in the space of a few weeks and soon ceased functioning at all. Visas to the United States became unobtainable. Meanwhile, television images showed a steady passage of persons crossing the borders, as well as the appearance of new, impromptu municipalities at the edges of cities and sometimes in public parks. For the most part, these settlements were not, as was incorrectly reported at the time, “colonies” of new immigrants, but associations of longterm undocumented persons who took advantage of the relaxed enforcement regime to move from cramped and often dangerous accommodations. There were notable outbreaks of civil disorder in several places. Unlike Angela Merkel, President McCain apologized. Contemporary political commentators have sometimes suggested McCain would not have received the Republican nomination in 2000, had it not been for the publication at a critical time in the primary election process of an old scandal involving his principal opponent. (The irony is that the information was Democratic opposition research intended for the general election but apparently leaked early to the press by accident.) Though no serious misbehavior was involved, the issue managed to depress his opponent’s appeal in the early southern primaries. McCain’s bid thus survived until the nominating process moved to the Midwest and Mountain states, where he enjoyed greater natural advantages. Still, the delegate vote at the Republican Convention that year was the closest in living memory. The nomination would have gone differently if a single state delegation had been on the other side. The general election, in contrast, was a popular vote and Electoral College landslide for the Republicans. Several reasons have been adduced to explain this result. The candidates seemed to differ only in degree except on social issues; these were muted in the election. However, the Democratic nominee was generally regarded as a continuation of the prior Administration, which had fallen under an ethical cloud. In any case, the popular dissatisfaction with the Democrats did not extend to Congress; McCain’s party actually lost control of the Senate by a single seat. The McCain Administration was the first since that of Richard Nixon to focus from the outset primarily on foreign affairs. These president’s early efforts did not invariably appear to improve matters. In his first meeting in Paris with the heads of the NATO countries, for instance, President McCain publicly engaged in a multilingual shouting match with President Jacques Chirac about who was more serious about controlling carbon emissions. Russian-American relations went from frosty to arctic after the first meeting between President McCain and President Vladimir Putin, when McCain made his notorious “evil ice dwarf” comment to reporters on the flight home. On some critical issues, the Administration does not seem to have been very well served by the terrorism experts retained from the prior Administration. These officials pushed their own pet projects and gave advice that almost invariably turned out to be misdirections. In any case, though the Administration came into office with a raft of proposed reforms for health care, education, infrastructure, and so on, these were shelved until the second term by the events of September 11: even the small, temporary, stimulative tax reduction that the Congress had enacted to deal with a mild recession was revoked to help pay for the subsequent unplanned military expenditures. The president was in Washington at the time of the attacks in 2001. He was widely criticized for foolhardiness in rejecting Secret Service advice to leave the city, but his extemporaneous address from the Oval Office that evening has been classed as model of modern rhetoric. His national security team quickly determined that the base for the attacks was in Afghanistan: the existing regime and the terrorist leadership it had been hosting had been removed by the end of the year. This by no means ended the war, since Islamist factions quickly regrouped across the Pakistani border and instituted a cult of the martyrdom of their former leaders. Nonetheless, the speed and the success of the invasion bought the president the prestige to go ahead six months later with a decapitating raid against the Baathist regime in Iraq. There followed a systematic peace-keeping and nation-building program on which the president was accused of lavishing more attention than on the government of the United States. The president was also criticized for confining the legal justification for the Iraq invasion to the UN resolutions of 1990 and 1991. His public case for the war was a set of sophisticated variations on the theme that the Baathist regime had never complied with the terms of the ceasefire of 1991 and could not be trusted to do so after the UN restrictions were removed. The president coined a phrase, “field of peace,” to describe what he was trying to “generate” in the Middle East. The concept was widely ridiculed, until the post-Iraq-invasion revelation by Libya of its enormous WMD programs and the new willingness of Iran to talk. These developments, and the fact that the nation-building strategy enabled the beginning of substantial troop reductions by the spring of 2004, silenced whatever criticism remained about the justification and conduct of the war. Emboldened by the personal popularity which these successes accorded him, President McCain made one of the most daring moves in American political history: he ran for reelection as an independent. To some extent, this move was forced on him: the Republican Party had broken up. The president politely accepted the nomination of the convention with the greatest claim to institutional continuity, but he appeared on most ballots as the nominee of the “Rally for the Republic,” essentially a privately organized network of publicists, financial backers, and key constituency groups. The disintegration of the parties at the national level was a foreseeable instance of the general trend toward “disintermediation” between producers and consumers in all areas of life. In 2004, his principal opponent in the general election was still a “Democrat,” though the nature of that group had changed profoundly since 1992. Thereafter, the movement toward increasingly personalized politics seemed irresistible. The Administration’s predilection for comprehensive, systematic treatment of domestic issues had mixed results. The new strategy of replacing employer-provided health insurance with privately owned policies had the primary effect of imposing a paperwork burden on the population comparable to that imposed by the (unreformed) federal tax code. There might have been a political crisis, had not the legalization of pharmaceutical imports caused a temporary but noticeable decrease in costs. President’s McCain’s chief domestic accomplishment was technical and procedural: the Tax Efficiency and Reform Act of 2005. This comprehensive tax-code reform lowered the top marginal individual tax rate to 28%, as well as abolishing the Alternative Minimum Tax; the reform paid for these features by abolishing almost all the deductions in the existing code. The reform was revenue neutral. Small federal budget surpluses had begun to reappear in 2004, the maintenance of which became the Administration’s chief fiscal priority. The reform of the Social Security system disappeared as an issue during the McCain Administration: experience showed that the projected insolvency point for the system retreated by a year for every year the budget balanced or showed a surplus. Other enthusiasms of President McCain proved less happy. His insistence on a complicated campaign-finance scheme alienated the ad hoc majority in Congress on which he relied for support. The measure was of doubtful constitutionality, and the Administration was probably saved an embarrassment when it failed. The episode lasted a month. The emergency was ended when the president was prevailed upon to invoke the emergency power granted to him in the immigration bill to regulate immigration in extraordinary circumstances. No permanent harm was done, but the country was badly shaken. The president’s speech of apology, in which he took responsibility for the bill and pledged to restore order, was almost unprecedented and highly effective. One of the ironies of the McCain Administration was that a man so interested in bureaucratic order enhanced his reputation chiefly through his ability to handle unpredictable disasters. The submersion of New Orleans may not, perhaps, quite count as “unpredictable”: few such events have ever been foretold with so much expert specificity so long beforehand. Nonetheless, the event occurred on McCain’s watch, and he understood the importance of what was happening as soon as it was certain the hurricane would make landfall near the city. He ordered his disaster managers and, more important, the Secretary of Defense to the city to monitor events. Before the lower parts of the city were completely flooded, he had invoked questionable but legally colorable authority to use the federal military as rescue forces and police. Perhaps the most famous scene of his presidency occurred the next day when he visited the city, personally “fired” the mayor, and ordered the detention of the entire city police force. His later refusal to sign any reconstruction legislation that applied outside the highland areas of the city remains controversial. President McCain is remembered for many other things, from his directive to NASA after the Columbia disaster to build an Earth-to-LEO manned spacecraft within a year to the creation of the League of Democracies. He is not always remembered with universal fondness. Nonetheless, his paradoxical presidency did not have the dispiriting effect that several other administrations of the past 50 years had had. His many opponents loved to hate him; his even more numerous admirers were frequently exasperated but never bored. A rare national consensus prevailed as he left office: the Republic had not been altogether badly served. If only John were still here, I would love to talk with him about the current slate of US Presidential candidates. In this post from 2003, you can get a feel for what he would have thought of Jeb Bush. John probably would prefer a third term from Bill Clinton instead of a first for Hillary[as would I]. I suspect John would find Trump gauche, but he would find something interesting to say about his candidacy. Scott Adams thinks Trump is a master of manipulation. Steve Sailer isn't so sure, but still finds Trump interesting. I think I want to see both Trump and Sanders run third party campaigns, and make the current parties implode. Also of relevance to US Presidential politics, John talks a bit here about the likely formation of a universal state in the latter half of the twenty-first century. Right now, Europe and the US are both exhibiting the some of the same patterns of events we saw in the Late Republican period of Rome. The attractiveness of the US and Europe to immigrants and refugees alike is an example of this. Finally, there is a reference to a couple of John's books: Apocalypse & Future, and The Perfection of the West. Both are self-published collections of his blogs and online essays. They were John's attempt to summarize his thoughts on millennialism and universal states. Which is pretty much what I am trying to do here. I still have no idea who owns the copyrights to John's works now, but I do my best in my own small way to promote his ideas regardless. No statement in a political magazine has alarmed me more in recent years than The Weekly Standard's recent assertion that Jeb Bush is the Republican presidential front-runner for 2008. (The Weekly Standard did two issues last week so they could gloat about Iraq longer, and I kept neither. I think the piece was "O Brother, Where Art Thou?" in the April 19 issue.] Part of the problem is just the realization that anybody, anywhere, is giving serious thought to the election of 2008 at this point. However, my alarm is chiefly due to what the candidacy of Jeb Bush would signal about the Republican Party. Jeb Bush is the governor if Florida, where he is reasonably well regarded, and the brother of the current president, who seems to like him too. The Weekly Standard quotes him rhapsodizing about emptying out the government offices in the state capital as he privatises more and more public services. He is very keen on tax cuts. If he has any ideas about foreign policy, he keeps them to himself. May I point out that his brother lost the popular vote in 2000 by running on that platform? And that was before the bottom dropped out of the fool's paradise we had been living in during the Clinton years about the irrelevance of war and diplomacy to domestic politics. You can't take a flight on a commuter airline these days without being frisked by the agents of world history. These people have to be paid. When someone assembles a budget, that sort of question has to be the chief consideration. The era of conservatism, indeed of social renaissance, is now upon us. The era of small government is over. If the national Republican Party still has not understood that, then it does not deserve to win any more elections. One person who is little tempted by soccer-mom politics is the economic historian and born-again imperialist, Niall Ferguson. In today's New York Times Magazine, he has an article, The Empire Slinks Back, in which he seeks to stiffen the American people to their imperial duty. If the United States were running a proper empire, he complains, Americans would be living abroad and administering things in the colonies, as the British did. The British were willing to do that decade after decade, even century after century. It seems that, right up to the 1930s, a remarkably high percentage of the graduates of elite British schools went forth to administer the empire. The US, in contrast, seems to regard the prospect of an occupation of Iraq lasting more than a year or two with deep misgivings. And who would run the protectorate, anyway? American colleges pay little attention to foreign societies, and particularly to foreign languages. In fact, the denizens of the prospective imperium are far more eager to come to the United States than the Americans are to go to them. What kind of an empire is that? I would respond that it's not any kind of an empire at all, but the beginning of a universal state. The US has a special role in the system, one aspect of which was discussed in another piece in today's Times. In American Power Moves Beyond Merely Super Gregg Easterbrook argues that the US military is so far beyond any possible combination of rivals that essentially the rest of the world has given up on the idea of a conventional arms race with America. No other country has a serious navy, he asserts, and even when the US fights a country with a modern air force, the enemy planes do not dare offer battle. This kind of piece makes me uncomfortable. Even if it were true, it would jinx the whole business. In any case, as I have pointed out before, the military preeminence of the US is like being smartest kid in the dumb room. The world is in fact demilitarizing. (Easterbrook gives figures suggesting that, worldwide, military expenditures have about halved in the last 17 years.) It is a matter of acquiescence, not of the absolute power of the United States. What the US has done is to monopolize a whole stratum of international life. This gives the US quite a lot of say in many contexts, but it's not the same as a traditional empire. It does not exclude the possibility of other countries becoming comparably preeminent in other spheres. Even if the US can be said to be the cop of the world, we should remember that cops don't run city hall. Of course, Ferguson's argument that the US is too impatient to run an empire should not be dismissed. The Astronomer Royal of the UK recently published a book, Our Final Century, in which he makes a plausible case for "doom soon." The book is also out in the US, but here it is called Our Final Hour. Now that's a difference in attention spans for you. For anyone who is interested, I would like to announce that my next anthology is in the works, The Perfection of the West. A print-on-demand book brought to us through the ingenuity of Xlibris, it pulls together just about everything I have had to say in recent years about the coming Universal State and related matters. It will take longer to appear than I had hoped, though. I should get the proofs in a week or two, but the book may not be available until well into the summer. 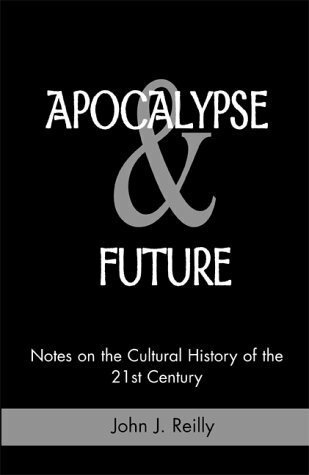 I do have another Xlibiris anthololgy, by the way: Apocalypse & Future. The Perfection of the West is slightly more cheerful. While John was a fan of TR, he did admit that the colonies Teddy Roosevelt so enthusiastically helped to acquire were useless, both geostrategically and in domestic politics. However, when John talks about empire, the acquisition of Puerto Rico and the Philippines isn't what he means. The empire [as opposed to an empire] is the ground state of a political and economic system when the will to maintain a more vigorous state is no longer available. This is what John is referring to when he says: "The basis of the Empire is not dominance, but acquiescence." The extent of an empire may be founded on the conquests of a vigorous leader, but its continued existence cannot be. Julius Caesar conquered Gaul, and then went on to create a template of political leadership that would directly continue for 1500 years [and indirectly until today]. Whereas Alexander the Great conquered an even greater extent of territory than Caesar, but it fell into strife and dissolution upon his death. On the gripping hand, the Roman Empire did about as well with Marcus Aurelius as Commodius. The empire does not depend on the charisma or skill of the Emperor to exist. Rather, the fact that the Emperor exists is what sustains the Empire. He is the still center about which everything else revolves. The formation of universal states is something that seems likely, given human nature. I think it would be too bold to say it is a Law of Nature, but it certain seems to be a stable tendency. Going by past experience, we can expect the formation of a universal state that will encompass most of the world by the end of the Twenty-first century. I will be an old man, if I live at all, before I have the opportunity to see whether this prediction comes true. I am curious to see how it all turns out. There is a relationship between American policy toward Iraq and the prospect of empire, but it's not the one you might think. Any American government, at any stage in the history of the United States, would have had to end the sort of threat that the Baathist regime in Iraq poses. In fact, America's first international war was a long, moderately successful campaign to suppress the Barbary Pirates. (You know the bit in the Marine Anthem about the "shores of Tripoli"?) Now, however, the international system is older, more constricted: you have to get a license to use force, even for self-defense. The problem is that the licensing authorities are both incompetent and autonomous. All the empire will mean is that the agencies will be answerable to an executive. There: that's the 21st century for you. America has a great deal to do with this process, but again, not in the way you might think. America once had an empire, of the same variety as the British and French and Dutch empires. We acquired it late and let it go early. The old colonial empires were just extensions of the nations that controlled them. They were never worth much, frankly, and they had nothing to do with what America was or wanted. What is happening now is different. We are seeing the beginning, not of an American Empire, but of the Empire. It seems at this point that it will be chiefly organized by the United States, but even that could change. The Empire is the terminal episode in the evolution of an international system. The Roman Empire, Han and Ming China, the Ottoman Empire: all were "universal states" of this class. The basis of the Empire is not dominance, but acquiescence. States may continue under the Empire, but the Empire is the ultimate source of legitimacy. In principle, it is the ultimate earthly guarantor of the minimum of order and justice without which civilization could not function. Although the universal state of the West is still two or three generations from final formation, we are already seeing debate about it. A useful polemic against the Empire is available on the website of the Future of Freedom Foundation, in the form of an essay by Richard Ebeling of Hillsdale College. The essay is entitled An American Empire! If You Want It instead of Freedom. Let me take in turn the points it raises. First, the executive power of the government becomes increasingly dominant. That trend has been exaggerated, and of course it was reversed after the Watergate scandal. Now it is probably being reversed again: not because of presidential hubris, but because Congress is terrified to be seen making a decision in public. For what it's worth, the executives of mature universal-states keep their jobs by doing as little as possible. Roman and Chinese emperors spent most of their time answering their mail. Second, domestic-policy issues become increasingly subordinate to foreign-policy matters. Twice in the 20th century, during the 1920s and the 1990s, the United States tried to reverse those priorities. The result in both cases was kaboom. Third, Empire threatens to result in the ascendancy of the military mind over the civilian mind. That is what happened, to some extent, under the colonial empires. Under the Empire, the trend is exactly the opposite. The characteristic feature of universal states is debellicization. The whole world becomes the European Union. Fourth, Empire creates a system of satellite nations. The Empire makes all politics domestic politics. Fifth, Empire brings with it both arrogance and fear among the imperial people. Even the colonial empires moved away from ethnic chauvinism in their last stage. As for the Empire, under it there are no foreigners. And, finally, Empire creates the illusion that a nation is a prisoner of history..."Destiny" has marked us for duty and greatness. The way that universal states form is contingent. The fact that they do form probably is not. Get over it. America's old colonial empire in the Philippines and the Caribbean really did contradict America's essential nature. The Empire, in contrast, was implicit in the American Founding. The Declaration of Independence famously says: "We hold these truths to be self-evident: that all men are created equal, and endowed by their Creator with certain inalienable rights." Rights are imaginary unless a social order exists in which they can be exercised. By declaring the rights universal, the Continental Congress implied the ideal of a universal order. Indeed, the Congress appealed to that order: the Declaration is addressed, not to the American people, or to God, or to specific sovereigns. It is addressed to "the decent opinion of mankind," to the consensus of civilization. The Empire is simply that consensus in institutional form. Regular visitors to my site will know that I have dozens of items online that deal with these matters in one way or another. As a convenience to readers, I am planning a paperback anthology on the subject: The Perfection of the West. It will not include Spengler's Future, unless I can fix the rights problem with the old publisher in a week or two. However, it should make clear some of the things I have been getting at these many years. Look for it this spring. Now for the other half of the beginning of the twentieth century, here is Teddy. Theodore Roosevelt redefined the American presidency through sheer force of will. The office of President was at a nadir in the decades following the Civil War, and the Congress was pre-eminent. Roosevelt was placed on the ticket as vice-President in order to get him out of the way. He never really saw eye-to-eye with the Republican party bosses, but his massive popularity was difficult to ignore. Vice-President was a convenient dead-end in which to place him, until an assassin's bullet propelled him into the Oval Office. Once there, Teddy did all sorts of outrageous things, often not stopping to inquire whether it was actually within the purview of the Executive Branch to do what he did. And he got away with it. All that is well known. John is a fan of T. R., as am I, and I am more interested in the less well-known aspects of this fascinating man. Despite his famous belligerency, Roosevelt was a gifted negotiator. He won the Nobel Peace Prize for the deal that ended the Russo-Japanese War, but he also ended the guerrilla war in the Phillipines [although not the Moro Rebellion] and convinced the Kaiser to settle his debts with Latin America instead of sending battleships to collect them. Roosevelt was perhaps one of the best read Presidents. He read two to three books a day. When given a book by a guest in the morning, he could discuss the book in detail at dinner. He attempted to reform English spelling by Executive Order, which is perhaps one of the few things in his Presidency that backfired so badly. I'm currently working my way through Edmund Morris' magisterial trilogy on T. R., and I also watched a bit of the recent PBS series The Roosevelts, but I skipped the parts about Franklin. I am simply in a Theodore Roosevelt mood, but that is never a bad thing. You don't need an excuse to read about Theodore Roosevelt. Still the youngest president (he was just shy of 43 years old when William McKinley's assassination catapulted him from vice-presidential obscurity), he was probably the most knowledgeable person ever to hold that office, even counting Thomas Jefferson. He was certainly the most colorful. In fact, his volcanic stint in office from 1901 to 1909 was a comparatively drab interlude in his life. If he had not existed, G. K. Chesterton would have had to make him up. It would take an awfully bad biographer to write a tedious life of this man, but this single-volume work by H. W. Brand (who teaches history at Texas A&M) is both solid history and a delight to read. The only problem is that, at almost 900 pages, the book is too short. Nevertheless, the study of Theodore Roosevelt's administration has become not just entertaining but topical. Historical parallels are always tricky, but many people (including President Clinton) have taken to comparing the present era to the Progressive Era of the first two decades of the 20th century. When Roosevelt took office, the federal government was just coming out of the coma it entered after the Civil War of 1861-65. In the interim, the country had been covered with huge new industries that the law simply did not address. Neither Europe nor Asia were as far away as they had been a few decades before, and for the first time in its history the United States found that it needed a strategic doctrine. At the same time, international capital flows were becoming large enough to affect even the largest economies, while immigration (in those days from eastern and southern Europe) was threatening to change the character of the country. Meanwhile, business and labor united in the demand that tariff policy keep the growing American domestic market all to themselves. Roosevelt proposed to deal with this new environment through what he called "large policy." In the cramped intellectual universe of the post-Cold War, post-federal deficit era, it is not unreasonable that people have started to look to Roosevelt for a more expansive view of government. So who was this Roosevelt character? He was born in 1858 to a rich family of stolid Dutchmen that had lived in Manhattan since it was Nieuw Amsterdam. As the whole world knows, he was a scrawny specimen with a life-threatening case of asthma, so he adopted a lifelong program of indoor and outdoor exercise. (He died at 60, battered and half-blind: there is such a thing as overdoing it.) Roosevelt never went to a conventional school until he entered Harvard, but by then he spoke the major modern languages and was already on the way to becoming a serious naturalist. He hunted big game in Africa and the Americas, often at the expense of institutions for which he supplied specimens. His chief regular source of income was a stream of purple-prose popular histories, supplemented by memoirs of his adventures and by ferocious political invective. (He was a distant cousin of Rudyard Kipling; it shows.) He was widowed once and remarried, fathering six children in all. Just out of college, Theodore Roosevelt was elected to the New York State Assembly as a Republican in 1881. (At the same time he published his first book, on the naval side of the War of 1812.) He was even briefly the minority leader, until the Republicans unexpectedly gained a majority and decided they did not want a kid running the legislature. He divided his time between politics and ranching in the Dakotas during the 1880s. The latter enterprise, into which he had sunk much of his considerable inheritance, lapsed when his herds were wiped out in the severe winter of 1886-87. Still, he continued to mount nearly annual hunting expeditions, and it was in this period that he began his influential multivolume history, "The Winning of the West." In the 1890s he served on (and dominated) the new federal Civil Service Commission, and then on the New York City Police Commission. (It was while serving in the latter post that cartoonists fell in love with his spectacles, mustache and teeth.) President McKinley made him Assistant Secretary of the Navy in the period leading up to the Spanish-American War of 1898. During that war he served in Cuba with operatic distinction as lieutenant colonel of a volunteer regiment (the "Rough Riders") in the chaotic but successful American advance on Santiago. The Battle of San Juan Hill did not for the most part occur on San Juan Hill, which in any case is actually a ridge, but Roosevelt really was stone courageous. Roosevelt's war record, helped not least by his own quickie book on his exploits, got him elected governor of New York State. There he showed a disconcerting tendency to make appointments for reasons other than patronage and to try to regulate monopolies. It was actually in order to restrain him that the Republican Party leaders made him McKinley's second vice president. McKinley's assassination by the self-described anarchist Leon Czolgosz (pronounced "Tsholgosh") put him in the White House. Roosevelt in office exercised functions no one knew the president had (and indeed didn't, until Roosevelt made them up). He threatened to send in the Army to take over the coal mines during a potentially catastrophic strike, thereby forcing the owners to come to terms with the union. He turned federally-owned land into the nature preserves that became the National Park System, this with only the flimsiest legislative authorization. At a time when the Supreme Court tended to strike down new business regulation, he got Congress to extend federal control over the inspection of food and drugs. He managed to get some real authority for the Interstate Commerce Commission over the railroads, whose monopoly pricing he remembered from his own days in the Dakotas. He acquired the land to build the Panama Canal. (The transaction, as his Attorney General delicately put it, was accomplished "without the slightest taint of legality.") He sent American forces to briefly occupy Havana without Congressional authorization. In fact, he sent the whole fleet on a round-the-world cruise and dared Congress not to appropriate the money to bring it back. The rules for American football were revised under White House auspices. He also tried to reform English spelling by executive order, but here Congress stopped him cold. It is the measure of Roosevelt that, though he often wrote and spoke of war as if it were a kind of extreme sport, he started no war when pulling the trigger was his own responsibility. In fact, he had a knack for negotiation. He negotiated an end to the appalling guerrilla war that had simmered in the Philippines since the U.S. acquired the archipelago in the Spanish-American War. He famously won the Nobel Peace Prize for hosting the negotiations that ended the Russo-Japanese War. Less famously, he was instrumental in defusing the Algeciras Crisis in 1906, and he persuaded the Kaiser to take his bad-debt claims against Latin American countries to the Hague, instead of trying to settle them by sending German battleships into the western hemisphere. Roosevelt was in fact a great believer in international law and the settlement of disputes by arbitration. He was far from pacifism, of course. In his view, it was not the function of international law to discourage war, but to regulate it. Roosevelt was an ideological imperialist. He did not just want an American empire, he liked the idea of empires in general. The reason for this was the same as his reason for supporting labor unions: he supported order for its own sake. Much the same motive probably also lay behind his support of a rationalized spelling for English. Put negatively, this means that he feared disorder. He had a particular hatred for anarchists of all descriptions, of course, but much the same sentiment informed his support of business regulation. Laissez faire economics made him nervous, because it appeared to allow chaos. One way to put it might be to say that Roosevelt liked power, but power employed to build things. On the whole he assumed that bigger was better. Canals, empires, populations: he supported pronatalist policies against the beginnings of the birth control movement. Even his antitrust policy reflected this principle, since he much preferred regulating monopolies to breaking them up. He had mixed feelings about immigration, but for most of his life he saw it as a good, provided there was no multiculty nonsense about keeping the immigrants in ethnic enclaves. In his mind, being a Lincoln Republican also meant being a an anti-racist Republican, because racism required leaving something unassimilated. Roosevelt may have been the first American statesman with a geostrategic sense. He understood that Eurasia has two ends, and the U.S. is in trouble if anything goes seriously wrong at either one. Whenever possible, the U.S. should support the states of the periphery against those of the interior. He had a genuine flash of prescience regarding the peculiar susceptibility of Russia to socialist revolution. In later years, he even understood that, if it became necessary to go to war with Germany, then thereafter it would become necessary to support a weakened Germany against the Slavic threat. This was the script for the 20th century, and he grasped it 30 years before anyone else. Roosevelt saw to it that his old friend and right-hand man, William Howard Taft, would get the Republican nomination in 1908. Taft was elected, and Roosevelt, just 50 years of age, left for a triumphal tour of Africa and Europe. This tour made him the most famous man in the world. At the end of it, he represented the U.S. at the funeral of Edward VII, and he was the one the other dignitaries wanted to see. (Roosevelt avoided seeing the young Winston Churchill. He thought Churchill was a shady self-promoter.) Then Roosevelt returned to the United States and spent the rest of Taft's term stabbing his old friend in the back. The reason he did this is fundamentally mysterious. Roosevelt had some real policy differences with his successor. Taft was much more accommodating to big business than Roosevelt ever was. (J.P. Morgan offered a toast when Roosevelt left for Africa: "America expects every lion to do its duty!") Still, Taft actually had a more vigorous anti-monopoly program than Roosevelt had had. Taft was friendlier with the Republican Party bosses than Roosevelt was, but that was not much of an accomplishment considering how much they distrusted Roosevelt. The answer seems simply to have been that Roosevelt was jealous. He was also incapable of self-knowledge, so he ascribed incompetence and bad motive to the people who excited his envy. Since there was then no constitutional bar to a third term, Roosevelt spent the rest of his life trying to get back into the White House. In the process, he ensured that Woodrow Wilson, a cerebral history professor of whom he would really and truly have cause to be jealous in a few years, would win the election of 1912. That campaign was one of the odder episodes in the history of electoral politics. Party candidates in those days were chosen only in part through popular primaries, so although Roosevelt got most of the elected delegates to the Republican Party Convention, the party bosses renominated Taft. Then Roosevelt's delegates walked out of the Republican Convention to another hall where the nascent Progressive Party was meeting. That Convention then nominated Roosevelt for president. Now the Progressive Party did not last long, but it provided the political agenda of the next 40 years. It had a moderate-liberal platform that included such things as unemployment insurance, the direct election of U.S. senators (who at the time were appointed by state legislatures) and an eight-hour workday. They were also the women's party, oddly enough for a body also known as "The Bull Moose Party," since they supported women's suffrage. Their convention, unlike the quadrennial fraternity blow-outs the other two parties would continue to hold until the 1960s, was a serious meeting of serious professional people. They punctuated their deliberations with the singing of serious songs, such as "Onward Christian Soldiers" and "The Battle Hymn of the Republic." This was the sort of Crusader politics for which Roosevelt had waited all his life, and he made the most of it. "We stand at Armageddon, and we battle for the Lord!" Roosevelt told the Convention. Interrupted only by roars of approval from the serious audience, he expanded at length on the peril in which civilization itself would be placed if the Progressive movement failed. In retrospect, it is easy to make fun of this kind of apocalyptic language, but the sense of impending apocalypse was quite common throughout Western civilization at the time. We see today that the intuition was correct, even if it sometimes fastened on unlikely objects. In the event, Roosevelt came in a distant second to Wilson in the general election. Roosevelt was followed even more distantly by Taft, who had remained in the race only to ensure that Roosevelt would not be reelected. Afterwards, Roosevelt abandoned the Progressives and went on another of his scientific expeditions, this one to the Amazon in the company of his son Kermit. Stricken with various infections, Roosevelt barely survived this trip, though the tributary the expedition mapped is still named after him. (The "Teodoro," people call it locally). Soon after his return the First World War broke out. Roosevelt gnashed his famous teeth. He wanted the United States to enter the war. He wanted to organize a volunteer regiment like the "Rough Riders." Most of all, he wanted to be president instead of "that creature" (more specifically "that skunk," or "that lily-livered skunk") Woodrow Wilson. That Wilson was as much a Progressive in policy terms as Roosevelt had ever been was irrelevent. Roosevelt became a genuine fanatic in his latter days, especially after the U.S. declared war on Germany in 1917. While previously he had always been able to distinguish doubts about unrestricted immigration from hostility to actual immigrants, in his stump speeches for the war effort he began to speak as if German ancestry were prima-facie evidence of disloyalty. Unable to imagine that some people might hold sincere convictions other than his own, he denounced pacifists and conscientious objects as traitors pure and simple. Neither was treason confined to private persons: his criticism of public officials for the mishandling of American logistics was so heated that the Justice Department actually considered prosecuting him under the era's generously interpreted laws against subversive speech. When the youngest of his four sons, Quentin, died in a dogfight over the Western Front, Roosevelt became if anything even less restrained. Roosevelt corresponded with Georges Clemenceau and Arthur Balfour, explaining as an expert just how weak Wilson's domestic position was after the Democrats did poorly in the congressional elections of 1918. There are lots of reasons why Wilson was unable to extract a moderate peace from the Versailles Conference, but Roosevelt's private diplomacy did not help. It may be that Roosevelt's unexpected death from a heart attack in early 1919 prevented him from achieving an even more perfect revenge on Wilson. By the time of his death, he was once again the most popular Republican in America. Had he sought the Republican nomination, he would almost certainly have gotten it, and had he been nominated he would almost certainly have won. Theodore Roosevelt's third term: now that is some alternative history to think about. If Roosevelt were alive today, he would have some intemperate things to say about the "New Nationalist" proposals to unplug his policies from the beginning of the 20th century and install them again at the end. His ideas, good and bad, were always forward-looking. He understood that the 20th century was going to be about socialism and world war, and he took the first steps to prepare the nation accordingly. Now these issues have been resolved, and the next century is going to be about something else; you can take your pick about what these things will be. The odds are, though, that we would be well advised to adopt Roosevelt's guiding instincts: we should fear disorder, and we should once again like building things. The Long View 2002-05-02: Bill Clinton in 2005! Another Constitutional law post from John. Since I'm not a lawyer, I'll refrain from commenting on the technical merits of his proposal other than to say it seems plausible to this non-specialist. I also think I remember a joke making the rounds a while ago about how W. was still eligible to run for re-election in 2008 since he wasn't really elected the first time. They tell a wonderful story about Kurt Gödel, the greatest of 20th century logicians. He fled Europe during World War II, and when he went to take the oath of U.S. citizenship before a federal judge, Albert Einstein himself came along as a witness. The judge chatted with his prominent visitors before the ceremony, unfortunately. Alluding to the collapse of law in Nazi Germany, the judge remarked that the Constitution prevented anything like that from happening in the United States. "Not true!" Gödel replied, and explained that he had found a logical flaw in the Constitution that could be used to found a dictatorship. It took Einstein two hours to calm him down. Say what you like about the Clinton Administration, it did at least provide an eight-year tutorial in aspects of constitutional law that almost no one had ever heard of before. Indeed, the Clinton's still have that effect, even though they left the White House almost a year and a half ago. Liz Smith, the gossip columnist, aired an argument in her column of May 7 for the proposition that Bill Clinton really could serve a third term. The notion is that, if Bill Clinton were elected vice president, presumably as number two on a Hillary ticket, he could succeed her if she did not serve out her term. Liz Smith has no pretensions to constitutional scholarship, and it is not clear who suggested the idea to her. Nonetheless, the argument is plausible. Section 1. No person shall be elected to the office of the President more than twice, and no person who has held the office of President, or acted as President, for more than two years of a term to which some other person was elected President shall be elected to the office of the President more than once. But this Article shall not apply to any person holding the office of President when this Article was proposed by Congress, and shall not prevent any person who may be holding the office of President, or acting as President, during the term within which this Article becomes operative from holding the office of President or acting as President during the remainder of such term. Note that this text does not address how long one may be president, but simply how one becomes president. It forbids anyone to be "elected" more than twice. Succeeding to the office is another matter, however. This provision does not, by its terms, forbid someone who has already been elected president twice from becoming president if the incumbent should die or resign. I might also remark that not only vice presidents can succeed to the presidency; a two-term president emeritus might be anywhere in the line of succession. But no person constitutionally ineligible to the office of President shall be eligible to that of Vice-President. At the time the Twelfth Amendment was ratified, the terms of eligibility in question were clearly those set out in Article II, Section 1, Paragraph 5, which require that the president be a natural-born citizen, at least 35 years old, and a US resident for at least 14 years. The Twelfth Amendment adds a further requirement that the president and vice president not be "inhabitants" of the same state. Did the addition of the Twenty-second Amendment add to the eligibility requirements? Not by the letter of the text. The Twelfth Amendment is about how presidents are elected, not about who can serve. All we are told about "eligibility" is that it is the same for the vice president as for the president. If succession by a two-term president is possible under the Twenty-second Amendment, the Twelfth does nothing to change matters. But might the Twelfth Amendment make a former president ineligible to run for vice president? Probably not, because no provision of the Constitution makes someone who has been twice elected president "ineligible for the office of President." The Constitution simply forbids such a person to be elected yet again. If there is no such ineligibility for a president, then there is none for a vice president. Even if my interpretation of the text were the only possible one, that would not settle the issue. A look at the statutory history of the Twenty-second Amendment might show that its drafters and the legislators who voted for it were all intend on ensuring that no one would ever again be president for more than eight years. In that case, a court asked to apply the Twenty-second Amendment would probably look to the intent of the Amendment, rather than to its literal terms. Of course, legislative history might also show that the drafters and ratifiers meant to leave open the possibility that an experienced gray head could serve again as president, presumably in some emergency when the government had been decapitated. When they spoke of "election," maybe that is what they meant. The only place to look for precedents would be the states. I am not a great fan of term limits in any form, but many states have them. It is quite possible that just the question we have been considering has arisen before. State court decisions interpreting such statutes would not be binding on the federal judiciary, of course, but they might be persuasive. From what little I recall about the subject, I believe that the states have tended to interpret term limits narrowly rather than broadly. In other words, if an incumbent makes a plausible argument for why a term limit should not apply, the courts will usually accept it. I doubt that the particular anomaly we have been considering is the one that Kurt Gödel was thinking about. I am also pretty sure that Bill Clinton has no intention of running for vice president in 2004, or in any other year. Still, it may someday be important that the rules for succession to the presidency are looser than those for election. Constitutional law is full of surprises.